It was the last woodwind to become a major part of the modern orchestra, and by the end of the 19th century, the clarinet had become a composer favorite in chamber music arrangements. Its pleasing tone and relative ease of reproduction made the “clarionet” a natural choice for solo instrumentals in the acoustic recording environment. 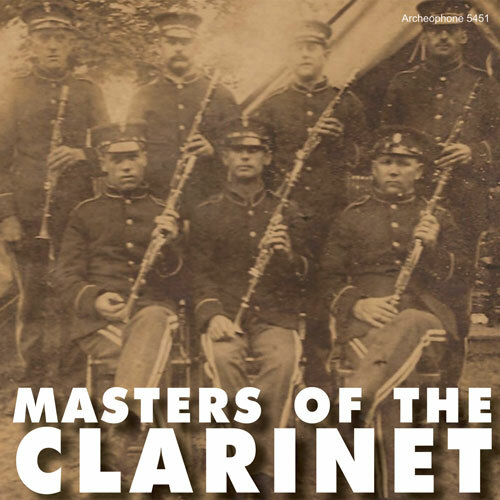 Masters of the Clarinet, 1892-1920 showcases the men–many from Sousa’s and Gilmore’s bands–and the music that made the clarinet so important to the growth of the infant industry. Make no mistake: the performances are priceless, but so are the specimens–many of these records are among the rarest Archeophone has released. Clarinetist and professor Stan Stanford walks us through the history of the clarinet, noting how the clarinet substituted for strings in community bands even as it became a staple of the orchestra–and the recording studio. Stanford offers many compelling theories for these developments, gives an overview of the clarinet’s recorded history, and offers brief biographical sketches of the artists on the CD, assisted in his research by many of the players’ descendants. The clarinet was recorded for commercial purposes right from the birth of the industry, with Henry Giese making records for Edison’s North American Phonograph Company. One of Giese’s stablemates, R. K. Franklin, is heard here in two North American selections from March 1892–two of the oldest extant recordings in the world. Franklin’s “Air and Variations, No. 2” and “Ballet Music from Mathias Sandorf” show remarkable mastery, as well as a breathtaking purity of tone and clarity. Another North-American-era cylinder, “Il Trovatore,” performed by an unknown soloist (see if you can make out the name in the obscured announcement), demonstrates the vexing job the arrangers had in trying to scale down the best-loved operatic arias to fit the two- to three-minute limitation of the recording medium. Some repertoire pieces were apparently audience favorites, because versions by several artists come down to us from the decades. You be the judge: who is the greatest master? On “Comin’ Thro’ the Rye” is it George McNeice, or Theodore Pusinelli, or Louis H. Christie? What about “Blue Bells of Scotland”? Is the version by Pusinelli or the one by Christie superior? Or, compare the 1892 Franklin version of “Ballet Music from Mathias Sandorf” with Tuson’s dramatic version from ca. 1903. Better, or just different readings for different times? As the 1910s wore on and jazz became the most popular music of the time, arrangements for clarinet–popular songs with variations, light classical fare and operatic arias–seemed to become quaint and less in demand. Jazz combos such as Earl Fuller’s Famous Jazz Band prominently included a clarinet player, but this was an entirely different milieu. Edison kept the old sounds alive the longest, and Masters of the Clarinet ends with recordings by Anthony Giammatteo and Frederick Brissett, who had long tenures with the Edison organization. “Maria Padilla” and “Fantasia for Flute and Clarinet from Simon Boccanegra” feature Giammatteo in duets with flutists Julius Spindler and Pietro Caso, respectively, while Ponchielli’s “Divertimento–Il Convegno” takes full advantage of the four-minute Diamond Disc format to showcase Giammatteo and Brissett. Unlike other pieces cut from the orchestral repertoire, the “Divertimento” was written for two clarinets. It is a stunning performance, possibly the most brilliant and idiomatic piece on the CD, and fitting conclusion to an important chapter in the history of recorded music.